We have reached a critical point where action must be taken to save one of the most important contiguous spans of 19th century architecture and history in all of Louisville. We as a community cannot allow the further deterioration of a large stretch of bourbon warehouses continue to the point where the structures are permanently lost and a new report suggests if action is taken soon to shore up the buildings, all or most of them could be saved. The site is the eastern two thirds of the 100 block of West Main Street dating from the 1850s to the 1890s and site of a March 2007 proposal called the Iron Quarter, a mixed use, sports anchored development a block from the new arena. Then, developer Todd Blue, president and CEO of Cobalt Ventures, planned an ambitious multifaceted $50 million project comprised of a luxury shopping arcade with a modern glass office tower rising from behind the historic facades. The proposal was made at the height of optimism in Downtown development when large-scale projects were creating headlines almost weekly. With the onset of the economic downturn, however, the availability of tenants that could make the Iron Quarter viable grew small and many feared the project would stall along with other mega-projects. Blue acquired the block when it was already showing signs of severe deterioration. The row of 19th century bourbon warehouses has been sitting abandoned for years and decades and one structure even collapsed in the late 1990s on the corner of First and Main Streets, leaving a scar still visible today. Â One of the reasons Blue had proposed the often controversial “facadectomy” technique – where the guts of a building are removed and the facade preserved – was because of the level of decay that had already set in. After a building under renovation by Cobalt Ventures partially collapsed at the nearby Mercantile Gallery Lofts in 2005, Blue is not willing to risk a dangerous repeat. He told Broken Sidewalk in an interview that he is unsure if the Iron Quarter buildings can be saved, but that public safety is his main concern. Blue cited his historic preservation successes at various project in the past but says safety will always trump preservation. That’s why Cobalt Ventures installed a chain link fence at the request of the city blocking the sidewalk last week. Jim Mims, director of Metro Louisville Codes and Regulations, said there’s no imminent threat that instigated the fence, and explains that now is not the time to press the panic button on the buildings’ condition. Cobalt Ventures had asked the city to place a fence on the site on two occasions last year to protect against possible falling debris, but Mims says such a fence is the responsibility of the property owner. It’s just one more sign of the continued deterioration and is already presenting major hassles for pedestrians on Main Street. In the past three years, the Iron Quarter buildings have decayed further through wind and ice storms all while lacking a proper roofs and enduring trees growing from their brick facades. 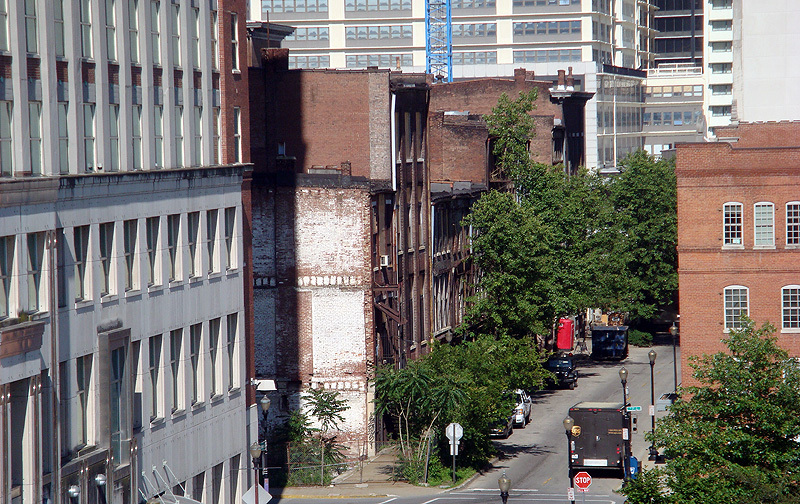 The situation drew the attention of Preservation Louisville in July 2009 when the group included the Iron Quarter buildings on their annual list of the Ten Most Endangered Historic Structures in Louisville. Preservation Louisville used the event to call for preserving the guts of the Iron Quarter buildings, not just the front facades, drawing attention to the facadectomy technique. Blue knows the properties are valuable, especially because of their proximity to the new arena. Others are converting three structures on the western end of the block into the Whiskey Row Lofts and the Patrick O’Shea’s Public House already. The Iron Quarter has been laying low since it was last in the news in February 2009. At the time, Cobalt Ventures was in negotiations with Humana to sign on as an office tenant, but that deal has since fallen through and Blue is reevaluating the project. Now while the project is being reassessed, it’s an opportune time to temporarily shore up the buildings and seal up the roofs from the decay inducing effects of the weather. The Downtown Development Corporation (DDC), a private non-profit group representing Downtown, has recently undertaken a preliminary evaluation of the condition of each Iron Quarter building to determine what is salvageable. In December 2009, the DDC hired Tetra Tech and Brasch-Barry General Contractors to analyze the current condition of the Iron Quarter buildings. As can be imagined, the structures aren’t in the best shape and suffer from mold, water saturation, and in some cases, partial collapse of interior floors. The report, finished at the end of January and just released, says the structures range from good and fair condition to poor condition indicating some interior collapse. The consultants, some dressed in Hazmat gear as a precaution, couldn’t access all parts of the buildings because of hazardous conditions and therefore the report can’t be considered comprehensive, but it offers heretofore unknown insights into the state of the buildings. Patti Clare, deputy director of the DDC, explained she hopes the study will “move the conversation [about the Iron Quarter] forward and elevate it in a positive way.” Above all, she said the DDC is looking out for the best interest of the buildings and their contribution to Downtown’s urban fabric. Based on the consultants’ limited observations, the major issue contributing to structural decay is the lack of a weather-tight roof on nearly all structures. Water was found in every building and some interiors were saturated with water or contained partially collapsed floors. Keeping the weather out and a building’s interior dry is crucial to maintaining its structural integrity. In the end, however, Cobalt Ventures must make the decision to stabilize the Iron Quarter buildings. Todd Blue noted that the DDC study is preliminary and wasn’t conducted by Cobalt Ventures. He says he personally doesn’t know the condition of the buildings and doesn’t want to undertake any effort that might result in a potential collapse. Blue continues to work with Metro Louisville and the Downtown Development Corporation. Jim Mims says his department has requested that Cobalt Ventures take measures to stabilize the buildings and, so far, Mims notes they have had a positive experience with Cobalt and hopes a resolution can be found to save the structures, although he says there’s probably little financial contribution the city can make to the stabilization effort. In the meantime, the sidewalk on Main Street will be blocked for the foreseeable future, an unfortunate situation given the amount of business opening up in the area and the crowds that will undoubtedly need the space when the arena opens, not to mention current Downtown residents and workers who must put up with the inconvenience. A stabilization plan must be prepared immediately to ensure the Iron Quarter buildings can be saved in the future. The original Iron Quarter proposal was filled with such optimism for the rebirth of Downtown and it doesn’t have to wither unnecessarily. That enthusiasm for the Iron Quarter block can still be rekindled even in another yet undetermined form. That starts with stabilization. This group of bourbon warehouses has been through a lot in their 150 year history. Some were around in the Civil War, all made it through the 1937 flood. They were standing in Louisville’s heyday and suffered neglect as the community disinvested in the urban core. It would be a real tragedy to lose them just before Louisville enters its next period of Downtown prosperity. I just have to offer a note of thanks to Branden for his – as always – clear, informed, balanced, nuanced reporting. We always get context, history, and appropriate data. Just this past weekend we took friends from Rochester NY quickly around downtown. They were very, very impressed. We noted, though, the blight that the east end of Iron Quarter created, and noted the need to save it as architecture and history. I wish we had had this report to share. If these buildings are lost, posterity is going to look on us with shame. “If these buildings are lost, posterity is going to look on us with shame”. All the more so if the Brownsboro Road Midlands projects goes ahead and the Iron Quarter project doesn’t. It has been awhile since I read that article but I believe it is the same developer. There are not the same. There are two Blue brothers. I believe they are both doing separate projects. And I might add, they are both good guys. So much has been lost of old Louisville. I can’t imagine what this block would look like if half of it gets demolished. The character would be destroyed, particularly the back street feel of Washington Street, the last of the old riverfront streets between Main and the former wharf. “Todd Blue, president and CEO of Colbalt, … still plans to develop the block eventually and is ‘cautiously optimistic’ a ‘new and better development’ can be built on the site once the current structures are razed.” Louisville Business First April 23, 2010, p. 16. This is not good..not good at all. Along with the "Twin Towers" site which is YEARS away at best, Main St. will rapidly be a corridor with HUGE gaping holes for many many many years..Where is the MFL? At the behest of the developers. RAZED? With the threat of ORBoP and its hideous slashing of downtown, and the failure of the city and developers to realize that architecture is one of our true assets, our downtown renaissance seems completely doomed. Seeing stuff on C-J and heard promo for WHAS11 at 11 – demo permit pulled. Did I see a hint towards saving the facades? Instead of having the social Marxists of the various Preservation societies involved in their usual Marxist mindset of telling others what to do with their own property, they should go ahead and bulldoze the whole thing. 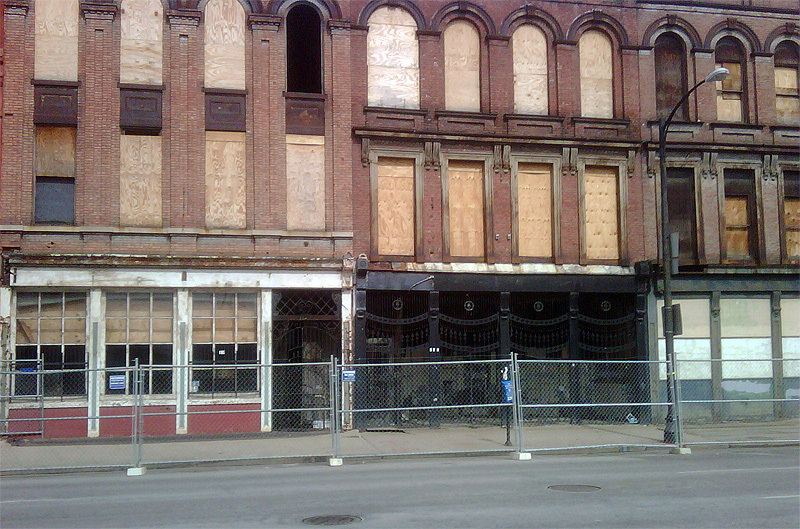 Louisville is a city stuck in the past with its old decrepit buildings that aren’t taken care of to start with. Most of the downtown area is a rancid dump and a cesspool to start with. Maybe if they cleaned things up around the city, there would be reason to preserve these old antiques. Otherwise, let the owners tear them down. Anyone in this sorry Third World city ever heard of private property rights and ownership. Welcome to Communist Amerika with a K. Just be a good little comrade and the Preservation Society will get the judge to put under house arrest anyone that believes in owning their own property. Maybe instead we should give these properties to the judges and preservation society full of unemployed losers that can’t have enough money to make these places viable. Instead, they have to use government force to get their aims completed. Thanks Chuck for the parody that makes the case for preserving our city’s rich heritage. Chuck, the attitude that you advocate is the very reason why block after block of downtown Louisville has become useless parking lots. The preservation of historic structures is absolutely VITAL to the continued vitality and vibrancy of ANY downtown area, and simply tearing them down after they’ve fallen into disrepair is a foolish and short-sighted way of thinking. That was the mindset of “urban planners” in the 50’s, 60’s, and 70’s, and the City of Louisville is still struggling to recover from from their mistakes. Louisville is a cesspool? You obviously weren’t raised here, or else you would know the good, stable quality of life that this city offers. Chuck, you are not a sane person.